A PRU is a maintained school that is set up specifically to deal with pupils that otherwise would not receive a suitable education for any reason, including illness or exclusion. PRUs are sometimes referred to as ‘alternative provision’. A maintained county school or special school cannot be a PRU. As with all mainstream schools, PRUs are required to abide by the SEN Code of Practice. This means that they are required to use their ‘best endeavours’ to secure special educational provision ('SEP') for children with SEN. However, there are a wide variety of PRUs; Ofsted warn that the ability of a PRU to meet a particular child’s needs can vary significantly and that this is dependent on the level of support that the PRU receives from the Local Authority. As with all mainstream schools, PRUs are required to abide by the SEN Code of Practice. This means that they are required to use their ‘best endeavours’ to secure SEP for children with SEN. 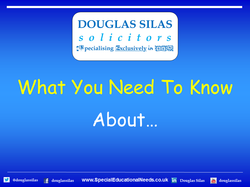 However, there are a wide variety of PRUs; Ofsted warn that the ability of a PRU to meet a particular child’s needs can vary significantly and that this is dependent on the level of support that the PRU receives from the Local Authority.